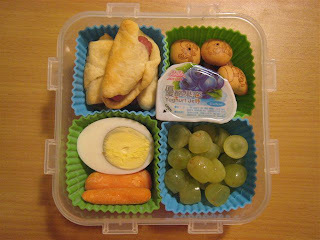 BentoLunch.net - What's for lunch at our house: And Matching Wednesday too! Since matching Monday was much easier on me than un-matching days, I opted for a matching Wednesday as well. We also needed a change of pace, so I decided to make something new for F&B. They (unlike their mother) are fans of the hotdog. I'm more of a fan of identifiable food. However, I sometimes do make things like that to humor them and had recently seen assorted ideas of hotdogs made to look like spooky things for Halloween. Again, still not a fan of the hotdog, but sausage can often be switched with hotdogs for a more palatable experience. So while at Target, we bought sausage and crescent rolls and made little mini wrapped sausages. They were a hit. I had to make more for Shaun (this is apparently where F&B get their affinity for hotdogs). Aren't these cute? 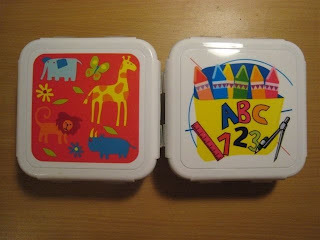 My dad bought them for F&B last year, they have snap down sides like Lock&Locks but much cuter. No built in dividers, so we just used square silicone cups. 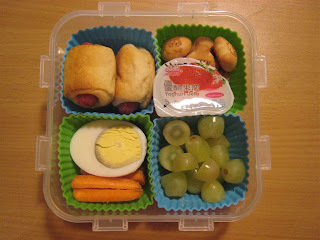 Ben has 3 little sausage rolls, half a boiled eggs, thinly sliced carrot sticks, grapes, panda cookies & a yogurt jelly. Faith has the same exact lunch, except I didn't have to slice her carrots to make sure she doesn't choke. How do you make your cute little pigs in a blanket? I made the hot dog muffins and we all took them for lunch. Thanks for posting these, I try to take a look at least once a month for inspiration. Everything in there I could just gobble up right now, delicious...and incredibly neat!